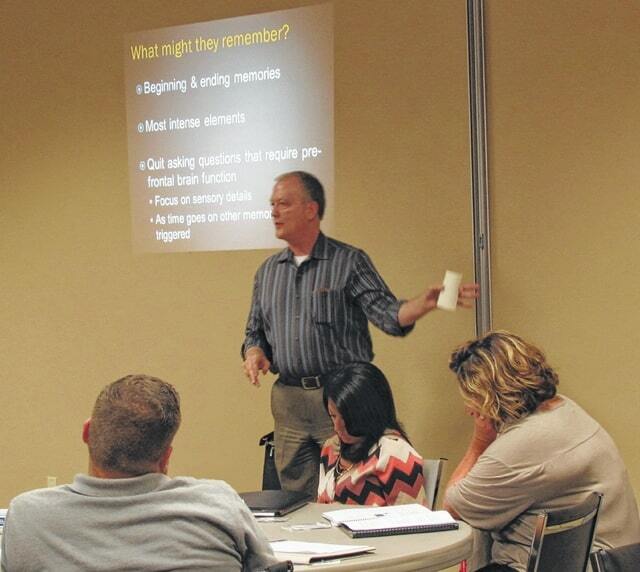 Presenter Gary Heath with the Ohio Office of Criminal Justice Services speaks Wednesday to attendees of a Sexual Assault Response Team training held at the North High Business Center in Hillsboro. Members of agencies within and outside Highland County gathered Wednesday for a Sexual Assault Response Team (SART) training in an effort to foster collaboration in handling not only sexual assaults, but other violent crimes. Those first responders, which not only include law enforcement but also advocates and hospital workers, with the training are better able understand a victim’s needs and victim trauma response, which in turn aids in better engaging the victim. It’s a focus of her office, she said, to get more disciplines trained in sexual assault response. The training also helps first responders feel “less isolated,” she said, because they are more aware of the roles of all involved. Understanding those roles is an integral part of the training, Huntzinger said. And it’s not just about those involved understanding their own roles, but the roles of others involved and where those roles overlap. “It’s just getting people on the same page,” Huntzinger said. Research shows, Huntzinger said, that a supportive, victim-centered network sees “more offenders held accountable.” There’s better evidence collection and better reports provided, which all aides in a better prosecution, she said. Highland County Victim-Witness Director Niki Glispie said that a problem not just in Highland County, but nationwide is that a lot of sexual assaults go unreported. But that’s not because they aren’t happening. Rather, she said, it’s due to a lack of understanding and awareness in the community, and the community seeing the ones that do get reported suffer for the lack of collaboration between all the agencies involved. Huntzinger said that her office has seen the training pay off in other communities in that, with outreach and collaborative, supportive efforts through the process of handling a sexual assault, more of the crimes are being reported, and more offenders are being brought to justice. Glispie said that with early intervention with the victim and through interdisciplinary training, the whole process is not only less traumatizing for the victim, but the victim is more likely to remain engaged throughout the process and less likely to become victimized by the justice system. Having training not only in sexual assault response but with all violent crimes, Glispie said, gets everyone working together, which is a benefit to all involved. In the various trainings the AG’s office offers, Huntzinger said it’s made sure that presenters represent various points of the process of handling the focus of the particular session, like Wednesday’s on sexual assault, which was funded by the AG’s office. Presenters included a representative of the Akron Police Department, Ohio’s Office of Criminal Justice Services, a Sexual Assault Nurse Examiner (SANE) from OSU East, and a representative with the crimes against children unit at Ohio’s Bureau of Criminal Investigation. County agencies attending included members of the prosecutor’s office, the victim-witness office, and the sheriff’s office. Other attendees were from Wilmington, Columbus, Chillicothe and Plymouth. Those present for the training represented “a wide range” of entities including law enforcement, advocates, medical staff, and the courts, Huntzinger said. But, she said she’s hoping Wednesday’s training, and a recent first meeting of a county collaboration board, will change that.